Now that I've cut the top off of my young tree, I can insert the scionwood. 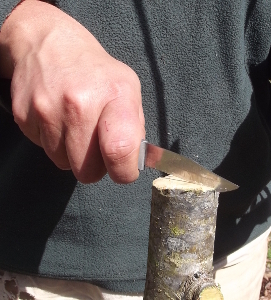 Step one is to slit the trunk of the tree vertically for about two inches --- making the cleft. Orchadists have special tools for cleft grafting, but I figured I could find everything I needed between the kitchen and the toolbox. The small, sharp knife shown below was too miniscule to do the job, but a big, dull butcher knife combined with a hammer was just right. 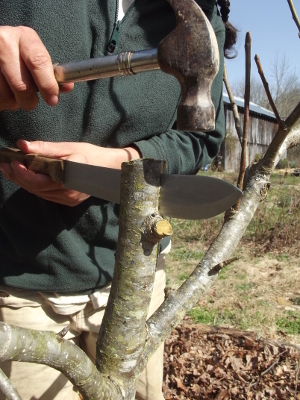 I hammered the big knife into the center of the trunk, then pounded on the sides of the knife to insert it a bit deeper. On my second tree, I didn't make the slit quite so deep, and found it more difficult to insert the scionwood, so be sure to make your slit big enough the first time. The next step is to widen the cleft using a wedge. Again, professionals use a special tool for this procedure, but a screwdriver pounded in easily and worked great. Cut the scionwood as described previously, then insert two pieces, one on each side of the wedge. If the cleft isn't quite as open as you'd like, you can rotate the screwdriver slightly to widen the gap. Scionwood insertion is the trickiest and most important part of the whole process, so take a few minutes to make sure you're doing it right. The diagram below shows a cross section through a piece of scionwood, illustrating the layers of different kinds of cells that make up a twig. 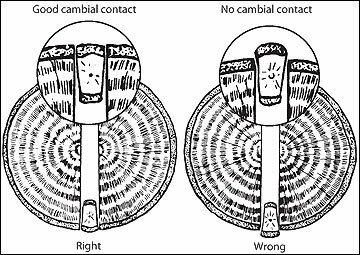 You can think of the cambium as the stem cells of the plant world --- the cambium cells are still physiologically flexible and can grow together with the cambium of a different tree. The cambium is relatively easy to see if you have good eyes since it tends to be bright green. 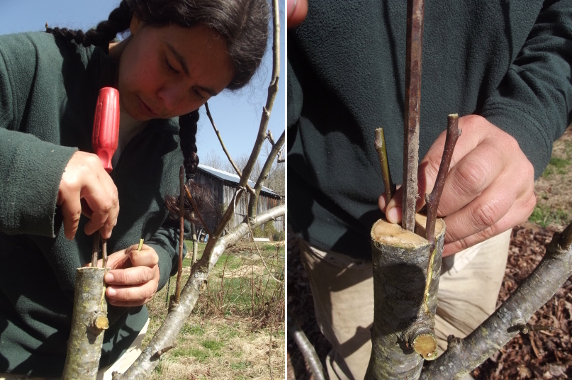 Your goal is to make sure the cambium of your scionwood lines up with the cambium of the tree you're grafting onto. Your gut reaction will probably be to try to make the scionwood fit flush against the side of the tree being grafted onto, but that's not quite right. 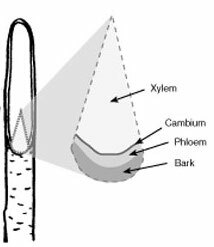 As a tree grows, it not only expands the xylem (the woody part in the center), but also the phloem (which turns into the bark). So, the cambium is going to be a little deeper into the older tree being grafted onto than it is on the little twig of scionwood. That's why most people recommend making sure your scionwood is slightly indented as you look at your graft from the side. One way to hedge your bets is to insert your scionwood at a slight angle, as is shown in the drawing to above, so that the cambial layers intersect somewhere. This type of angled scionwood placement won't give you as strong a connection, but is better than nothing if you're not sure you'll get your cambial layers lined up otherwise. One last note on scionwood placement (which you really should have considered when making your cuts) --- most sources recommend that the first bud on your scionwood sits just above the top of the tree being grafted onto. 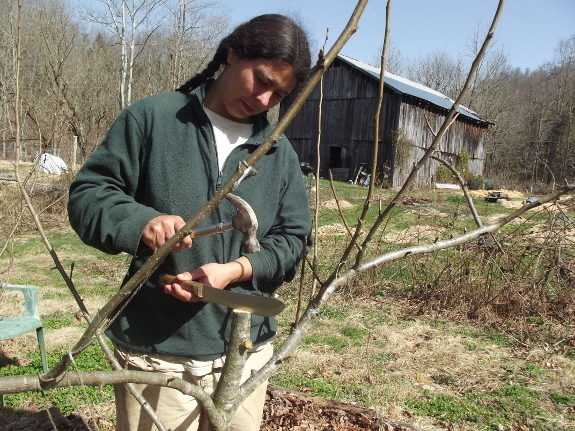 If you had extra scionwood length, now is a good time to cut each one down to two or three buds. Stay tuned for tomorrow's post, in which I'll explain how to seal the cut surfaces. Learn easy ways to attract native pollinators in my 99 cent ebook. I have a quick question. Would a cleft graft like this potentially work on a tree that has been completely topped? I have a snow fountain weeping cherry grafted onto a birch bark cherry trunk. The trunk looks fabulous, but the top graft has been severly neglected and is diseased. 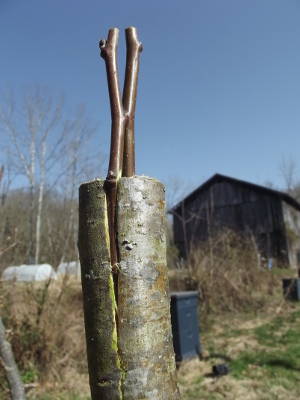 I thought I may try my hand at grafting sour cherry onto the trunk and seeing what happens. Any thoughts? Wedge: I honestly cannot believe anyone would buy (or even design) a wedging tool specifically for that purpose. Is it really a wedge or does it look like a speculum? If you needed more control than a screwdriver, why on earth wouldn't you just use a chisel or a wedge cut from a block of wood? Excellent questions, Jeremiah! From what I can see, the wedge tool that grafters use doesn't just act as a wedge -- it also is a bit of a pry bar and knife, all in one. So, you skip the cutting step, just pounding the wedge tool in and then prying the cut open. 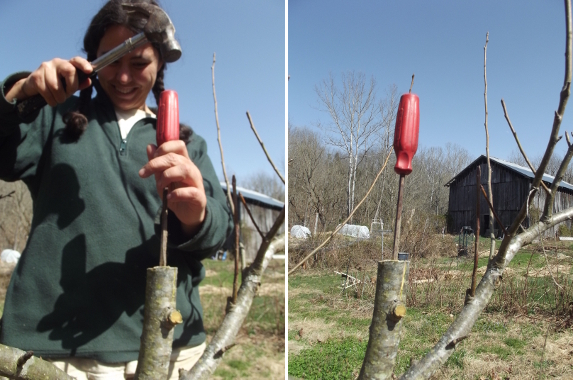 I'm sure the idea is speed --- you would probably topwork a whole orchard much faster with the fancy tool. However, you do have to be careful, because the lower parts of the tree will still sprout vigorously. Those sprouts will be the old variety, so you have to cut them away once the new variety gets established. After a year or two, though, the roostock starts to behave because of apical dominance --- plants put most of their energy into the highest up bud(s). That's the same reason that if you want a plant to bush out, you pinch off the top, deleting the apical dominance and giving the side buds free rein. Anonymous --- No, you only need the cambium on the side that's coming in contact with the tree's cambium. But it's probably easier to leave that bark in place on the inside of the scionwood than to whittle it away.